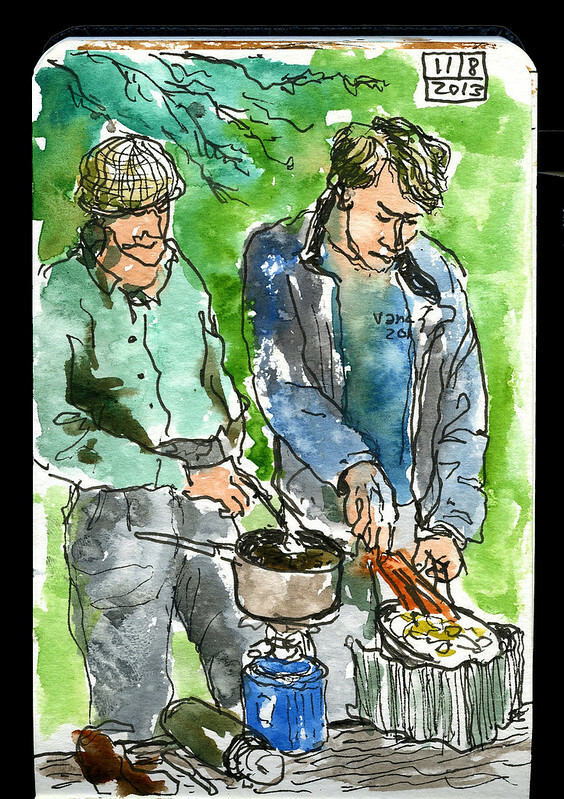 Day 2: Our friends (they are brothers) are cooking breakfast for all of us after our first day of hiking. Those logs never seem to be long enough for all the paraphernalia we place on them. We were camping overnight at Bear Beach. Day 1 was a mad rush to even get to our first campsite before dark because we only started our hike at China Beach at 3:30 pm after a long drive down the Island and some complications — there was no time for drawing that day. Six of us (two friends, our teenage visitor from Germany, my sister, my husband, and I) hiked the Juan de Fuca Trail on the west coast of Vancouver island, BC. It’s a 4-day hike over 47 km along rugged coastline. But we planned to cover only 29 km of it over 3 days to arrive at a beautiful beach called Sombrio. We had hiked the northern half of the trail three years ago and fallen in love with Sombrio, so this year we finally managed to all get off at the same time and do the southern half of the trail. We encountered some rats which chewed through 3 of our backpacks. We thought we had stored all our food in the bear cache but one of us forgot some pasta, one of us missed a chocolate bar, and another didn’t realize toilet paper was a rat food as well, so we were all taught a caching lesson. We saw lots of seals, but no bears, to the German teenager’s simultaneous disappointment and relief. But he fit in well on a hike with five adults, he loves hiking and wilderness. He even got stung in one ankle by two wasps and dealt with it well, and he always offered to cook — once he figured out our rule that whoever cooks a meal, does not do the dishes. He also observed that the forest was much wilder than in Germany, where most forests are tightly managed and dead trees are removed. The sight of giant, decomposing trees slowly turning into forest soil was amazing to him. He also observed that being away from Facebook for four days turned out not to cause unbearable suffering, but was a welcome relief from social obligations, and that one should take those breaks more often. Huckleberries and salal berries were plentiful, and even thimbleberries and salmonberries were located by the most enthusiastic berry detector in our group. I brought along a tiny moleskine watercolour sketchbook, which was lighter and made sketching way faster. Day 2: We found a beautiful spot in the forest on a ridge we were hiking along and decided to stop for lunch. It was my sister’s turn to prep food, and she actually got out the cooker to make a quinoa mix to stuff into pitas with hommous. We usually do one 3-day trip every year as a group, and we divide up the cooking duties so that each person is responsible to shop and cook for a couple of meals. Food becomes very important on a backpacking trip, the energy level has to be kept up when you carry 38 lbs. on your back up and down the steep coastal terrain over mud-soaked roots and slippery rocks. Day 2: We set up our second night of camping at Chin Beach. I had time in the fading light to make a sketch of the driftwood at this beautiful beach. What is it about driftwood and large rocks that makes one run around on top of them and jump from one to the other? Probably because that is so much more fun than skipping around on a flat surface. Day 3: The third night of camping, and our final destination, was Sombrio Beach. Day 3 on the Juan de Fuca Trail was probably the toughest in terms of hiking terrain, but by then we were broken in and had found our rhythm. We had also planned for Day 3 to be a short hiking day with only 8 km, but we stretched it out by taking a long lunch break on some rocks near blow holes, goofing around on top of a waterfall, lots of picture-taking and berry-picking for our pancake breakfast the next morning, so that we got to our last campsite later than we thought. But we had time to bathe in a cold creek, and enjoy the gorgeous scenery around us. The next morning, the sun came back out and we were able to linger at the beach until noon before hiking a short path up to a parking lot where we had left one of the cars. Day 4: The ferry ride from Sidney to Vancouver on a Tuesday evening was half-empty, quiet, warm and sunny. Seeing the various islands and land formations glide by in the early evening light is always a glorious view. It was a great ending to a wonderful hike. Then, after four days without a warm shower, it was great to come home to our plumbing.